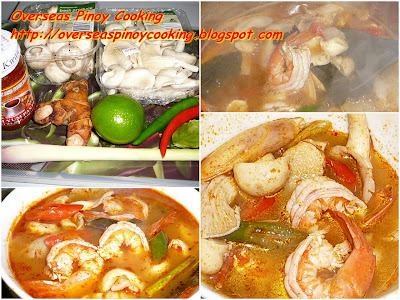 Tom Yum Goong, Hot and Sour Shrimp or Prawn Soup another popular soup dish from Thailand. It is also slowly becoming popular to Pinoy especially those who have tried the dish not only in Thailand but in the neighbouring countries such as Singapore and Malaysia. Tom yum is a hot and spicy soup dish of either seafood or meat flavoured with fish sauce, kaffir lime leaves and juice, lemongrass and galangal. The dish is supposed to be really hot and spicy. But the amount of to tum yam chili paste can always be adjusted to ones hotness tolerance. I you are into real hot and spicy soup and have access to the ingredients why not try the recipe. Remove head and peel off shell each shrimp. Set aside head and shell. Slice each shrimp at the back and remove intestine. Using pestle and mortar pound into paste shrimp head and shell. Dilute paste in 2 1/2 to 3 cups of warm water. Pass thru a sieve to separate shells from the juice, discard the residue. In a pot boil the shrimp juice. Add in lemongrass, galangal and kaffir lime leaves, simmer for 3 to 5 minutes. Add in tom yum chili paste and button mushrooms simmer for 3 to 5 minutes. Now add in the red and green chili, shrimp and oyster mushrooms, simmer for another 2 to 3 minutes or until the shrimp change to bright red color and just cooked. Before serving add in the lime juice and fish sauce half quantity at a time taste saltiness and sourness add more if required. Garnish with sliced spring onion, serve hot. You can find galangal and kaffir lime leaves in some week-end markets like the Salcedo Market in Makati, they may be available in dried form at Landmark Supermarket, South s Supermaket.